Man Utd have secured back-to-back wins in the Premier League and so with the pressure alleviated for now, some of the players have rightly taken the chance to enjoy themselves. The Red Devils were undoubtedly under the cosh a few weeks ago as after consecutive defeats to Brighton and Tottenham, things looked bleak for Jose Mourinho and his men. To their credit though, they’ve rallied since and picked up wins over Burnley and Watford either side of the international break, and they’ll be hoping that they can now kick on and compete on various fronts this season. 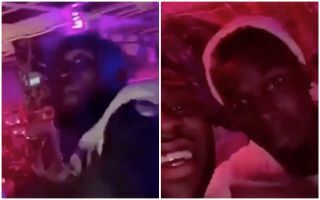 With their next game coming in the Champions League with an away trip to face Young Boys on Wednesday night, some of the players took the opportunity to wind down over the weekend, as seen in the videos below. Paul Pogba, Romelu Lukaku, Eric Bailly, Anthony Martial, Victor Lindelof and Marouane Fellaini were amongst those who ventured out, and it has received a positive response on the whole from Man Utd fans who have seen it as team bonding and a show that spirits are currently high. Time will tell how long that lasts for though as results will dictate the mood in the Man Utd camp. For now though, they’re certainly in a happier place and confidence will undoubtedly be growing. Our United players bin go club together, na Team bonding ? ?